There are thousands of different chemical reactions occurring in even the smallest animals and plants. These reactions are essential for life. If they stop, the organism dies. All the chemical processes in an organism are called its metabolism. There are seven important characteristics or life processes common to allplants and animals. They grow.Plants grow all their lives, but animals usually stop growing once they are adult. Even when growth stops, the materials in an animal's body are being replaced by substances from its food. In an adult human being, all the chemicals in the body are replaced over a period of seven years. They feed.Organisms must feed in order to grow. Food is needed for growth, for energy and to replace worn-out parts. Animals and plants feed in different ways. Plants take in simple substances like carbon dioxide and water. They use these simple substances to make more complex substances which can be used as food. In order to do this, plants need energy which they get from sunlight. This process of making food is called photosynthesis. Animals eat plants or other animals. They then break down the complex chemicals in their food into simpler substances. These simpler substances are then used for growth or energy. They need energy.Living things need energy to grow, to replace worn-out parts and to move. They get this energy from their food. The process of breaking down food and gaining energy is called respiration. They get rid of waste products.Organisms are like factories. Materials are constantly being taken in and used to produce other materials. Some of the products are useless, others are poisonous. The waste products of metabolism must not be allowed to collect in an organism or they will poison it. So the organism must get rid of them — this process is called excretion. They produce offspring.Organisms must produce offspring in order for the species to survive. This process is called reproduction. Usually reproduction involves the union of a male and a female of the same species. This is called sexualreproduction. Some organisms can reproduce on their own without needing both a male and a female. This is called asexualreproduction. They move.Animals can move parts of their body or even their whole body from one place to another. Plants cannot move themselves from one place to another, but they can move parts of their structure. For example, leaves may turn towards the sunlight and roots may grow towards moisture. They respond to stimuli.If someone tickles you, you will probably draw back. The tickling is a stimulus,your drawing back is a response. The main stimuli to which organisms respond are heat, light, sound, touch and chemicals which have tastes and smells. In general, plants respond to stimuli much more slowly than animals. 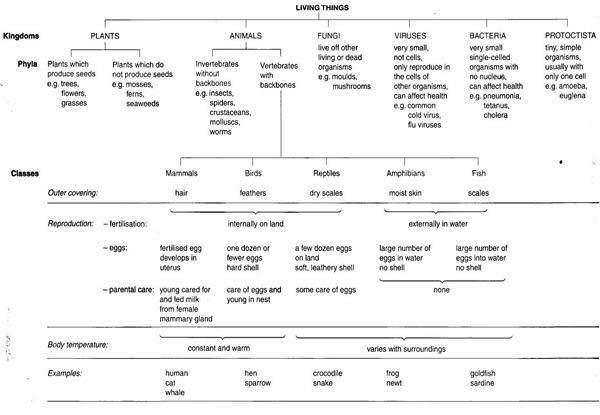 Prove that the organisms listed below are living things. There are more than one million different organisms. Studying them would be impossible without sorting them into groups. These groups are then divided into smaller groups, and so on. The members of a group have similar features. Living things are first divided into kingdoms.These include the animal kingdom and the plant kingdom. Kingdoms are then divided into phyla(singular, phylum). For example, there are two phyla in the animal kingdom — vertebrates (animals with backbones) and invertebrates (animals without backbones). Each phylum is split into classes.For example, there are five different classes of vertebrates. Look at Fig. 1 and identify them. Some important characteristics of the five classes of vertebrates are shown in Fig.1. Say, what you have learnt from the table about the principles of classification. Read the texts about the relationships of living organisms. Learner's dictionaries: their characteristics and problems of their compilation.